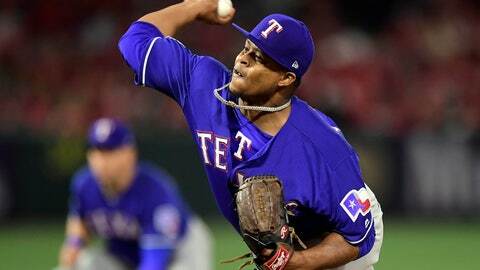 ANAHEIM, Calif. (AP) — The Texas Rangers have put pitcher Edinson Volquez on the 10-day injured list because of a sprained right elbow. The Rangers made the move before Friday’s game against the Los Angeles Angels and called up pitcher Kyle Bird from Triple-A Nashville. Volquez missed all of last season after undergoing Tommy John surgery in August 2017. The right-hander went 3 2/3 innings in Thursday’s 11-4 victory over Angels as he allowed two runs on four hits with four walks and three strikeouts. The 35-year old Volquez — who pitched a no-hitter with the Miami Marlins in 2017 — had no record in two starts with a 7.04 ERA. Manager Chris Woodward said that Volquez told him before the game that something didn’t feel right but that he could pitch. Woodward said that Adrian Sampson was a possibility to move up into the rotation. The right-hander went six innings in relief against Houston on Monday and allowed a run on four hits in a loss. Bird was on the Rangers’ opening day roster and made two appearances during the opening series against the Cubs. The left-hander went an inning in both games and didn’t allow a run.